Mar 27, 2018 Peter Hodson, a Bay Street Fund Manager, decides to go it on his own and help individual investors. In the second episode of the MoneySaver Podcast, we talk to Peter Hodson, founder and Head of Research at 5i Research.ca. He talks about what the fund industry doesn't want us to know. 1. What made you decide to switch directions in your career? 2. What kind of a company did you want to start? 3. Do you see a conflict of interest when brokers or fund managers are buying IPOs (Initial Public Offerings)? 4. What are the investors' chances of success in deciding to pick stocks versus an indexing strategy? 5. What are the mistakes that investors make that you have to keep reminding them not to make? 6. Do you help by letting people know when to sell a stock? 7. Can you give us a guide to reading an analysts report on a stock? 8. Tell us your philosophy about dividend stocks and yield. 9. How can you tell if a company has the ability to raise its dividend especially if a dividend is quite low? 10. Do you buy companies that have debt? What is an acceptable amount of debt? 11. What would be the minimum amount of financial history that you would want to look at when you buy? 12. Who tends to be the typical customer that is subscribing to 5i Research? Not a subscriber yet? 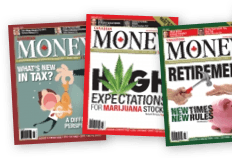 Get a free issue of Canadian MoneySaver Magazine and a coupon for 20% off your subscription here.